The European champions’ new manager is planning to build the club around the Wales star following the Portugal legend’s exit. REAL MADRID HEAD coach Julen Lopetegui is convinced Gareth Bale can step up and lead a new-look attack in the absence of Cristiano Ronaldo. 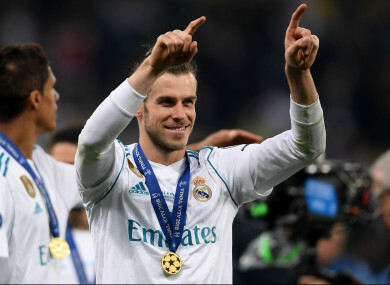 Bale hinted at a move away from Madrid after his two-goal display in the Champions League final victory over Liverpool in May – the Welsh star frustrated with his lack of starts under Zinedine Zidane. The 29-year-old’s frustrations sparked rumours of a move to Manchester United but Zidane has since departed the Santiago Bernabeu and replaced by Lopetegui, while Ronaldo completed a sensational €100m (£88m/$117m) transfer to Juventus. And former Spain boss Lopetegui – who spent time at Madrid as a player – is planning to build his the La Liga giants around Bale. “When I signed, Cristiano still belonged to Real Madrid but soon he expressed his desire to leave,” Lopetegui told reporters in Miami. Madrid, meanwhile, have been linked with a host of stars as they attempt to replace five-time Ballon d’Or winner and all-time leading scorer Ronaldo. Neymar, Eden Hazard and Kylian Mbappe have emerged as potential targets, while Chelsea goalkeeper Thibaut Courtois continues to be linked. Speaking ahead of Tuesday’s International Champions Cup opener against United at the Hard Rock Stadium, Lopetegui said: “We are delighted with the squad we have and are convinced that we will fight for all our objectives, and it cannot be any other way at Real Madrid. Email “New Madrid boss Lopetegui convinced that Bale can fill Ronaldo void”. Feedback on “New Madrid boss Lopetegui convinced that Bale can fill Ronaldo void”.